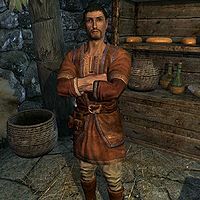 Lucan Valerius is an Imperial pawnbroker, and the owner of Riverwood Trader in Riverwood. His store was robbed by Arvel the Swift, who stole an antique golden claw and retreated to Bleak Falls Barrow. Lucan will task you with retrieving it. He wears a set of lower class clothes and a pair of boots. He carries the key to Riverwood Trader as well as a selection of common items and gold. He wields an iron dagger and an iron mace. If you ask him about the argument, Lucan will reply "Yes, we did have a bit of a... break-in. But we still have plenty to sell. Robbers were only after one thing. An ornament, solid gold. In the shape of a dragon's claw." At this point, you can offer to bring back the golden claw for him. Lucan will then direct you to the thieves' hideout and offer a reward for the claw's return: "You could? I've got some coin coming in from my last shipment. It's yours if you bring my claw back. If you're going after those thieves, you should head to Bleak Falls Barrow, northeast of town." If Lucan dies, his sister Camilla Valerius will take over the store. Contrary to what Lucan says, Bleak Falls Barrow is west of Riverwood. If you invest 500 gold into his shop (using the Investor perk), it adds 10,000 gold instead of 500 gold to his inventory. This page was last modified on 1 June 2016, at 18:04.